Behind My Red Door: My Husband Rocks!! Yes he does!! This man is so good to me!! In addition to tolerating, and even helping me move my things when I get in the tweaking mood, he takes such good care of me and our family. This picture was taken last April in the Valley of Fire State Park in Nevada right after Jay and Ang said their marriage vows in the outdoor cathedral surrounded by the red rocks. It was their dream to be married there, and this man flew 7 of us out there, put us all up in the Luxor for 4 days, and gave us Cart Blanche well ALMOST Cart Blanche - to make the wedding and the rest of that amazing and fun weekend happen. That was in addition to putting on a tux for the traditional formal sit down dinner reception back home the following weekend. Sure, that was a biggie, but he always makes sure we have the big and little things that are important to us - even when he doesn't even 'get it' sometimes. Just this past weekend when my computer crashed yet again, he spent hours getting it up and running so he could be 100% sure he had saved the files and pictures and graphics that were important to me. THEN on Tuesday morning, when I was stressing about loosing my computer, and stressing about my surgery later in the day, on his own he researched comoputer deals and he ran out and bought me a brandy new computer. THEN he drove me to my dental surgery and waited for me while I was being tortur - I mean had my surgery. THEN he went out and the car all warmed up so when I was done, I could get into a nice warm car for the ride home. He drove me home and got me all settled, and took off to get my prescriptions filled and pick up some pudding and ice cream and other soft comfort foods for me. THEN he came home and spent several hours getting my new computer all set up and loaded all my old files onto it. And he has been taking care of me all week. For all my sweet friends who have asked, I am doing OK - thanks to all of DH's help. I'll spare you the details but suffice to say the surgery was much more involved than we expected and I am still pretty sore. I had to take the pain meds around the clock the first few days and they left me feeling almost hungover after a while. But each day is better, and I thankfully I get all my stitches out on Tuesday, and hopefully in a few weeks I can say - no more pain!! But back to my wonderful hubby. So THEN yesterday he got up very early and took my Murano for me and got me 4 brandy new tires (that cost as much as gold bullion I swear!!) just so I would be safe driving when the first snow comes And even though he hates to shop, knowing I was still feeling pretty darn lousy, he asked me what I needed for the birthday party we are having for my Dad tomorrow (he turns 87 TODAY) and he made a grocery list and off he went to buy it all. Now this man who hates to shop, who has been waiting on me all week, helping me all week and spending money on me all week, came walking up the stairs from the garage, one full grocery bag in each arm and he was .... whistling! Cheerfully whistling!! Most men would be griping or complaining or sullenly silent, but not my sweet guy. He whistles!! He really makes it easy for me to want to keep a nice home for him and our family. So TODAY, on my sweet hubby's 56th birthday, (yes my hubby and my dad share the day) I want to say thank you to this man for all he is and all he does! And now I need to post two awards I received this week. The very talented and uber creative Gina over at Cap Nap Inn Primitives honored me with the Spreader of Love Award. Isn't this cool? I am happy to be known as a spreader of love - that works for me!! Thanks Gina!! And Lura, better known as Grammy, over at Grammys News nominated me for the Kreativ Blogger award. Thanks so much Lura! You are so sweet and I love reading each and every one of your sweet posts!! Mention the blog that gave it to you. Comment on her blog to let her know you have posted the award. Share 6 values that are important to you. Share 6 things you do not support. 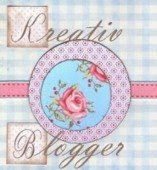 Share the love with six other wonderful blogging friends. Because I have accepted this in the past, I will leave it at this and as is my award policy, I pass this on to everyone who has a blog! Well folks, that is about all I can muster up right now. I hope you all have a wonderful weekend and I hope to back here and up to par in a day or so. In the meantime, I have been reading your blogs, just not always commenting. UPDATE - I typed most of this post last night. We are in a severe ice storm right now and all around us, power is out and trees are down. The skylight in ny DD's kitchen had a tree go through it at 1:30 AM and her BF's truck was smashed-totaled by another tree. DH and I have power but no cable. I am typing this update on his work laptop's air card. My elderly folks are freezing and without power and so we are trying to find a way to get them here. Please pray we can!! Thanks! Additional update: Our son and pregnant DIL and Brady are here, they lost power too. DH and Jay got my parents over here and so they are safe and warm and the birthday meal we had planned for tomorrow will be eaten today! Much of central, western and northern MA is without power though. The sun is out so the ice is falling off the trees but it will be days before some folks get power. Thankfully we never lost it- only our cable and Internet. I am once again on DH's air card. Our DD's aprtment roof is a mess and so we may have a lot of overnight company tonight - but thankful we can offer them safe haven in the storm!! I hope all is well in your world!